Educators using our programs are invited to register for any applicable online courses listed below. These 12-week courses are offered in the fall and winter. Fees are paid per person. Space is limited. This course will be offered in Fall 2019. Please check back for registration details. This 12-week online course (1 session every 2 weeks) is offered in both fall and winter. 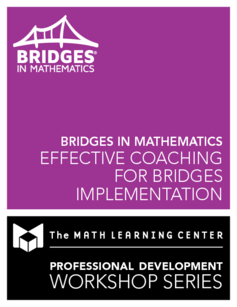 It is designed to support math coaches and instructional leaders working to increase student achievement and teacher content knowledge during a Bridges in Mathematics implementation. This course begins January 14, 2019 and ends April 7, 2019. During these 12 weeks, participants will have 2 weeks to complete each session. If all course requirements are met, a letter of completion for 30 contact hours may be provided. This course does not offer college credit. Register early as space is limited. Registration ends either on January 10, 2019 or when this course is full. For more information, please call 1-800-575-8130 or email Ana Butler. This 12-week online course (1 session every 2 weeks) is offered in both fall and winter. It is intended for those using or supporting Bridges Intervention. 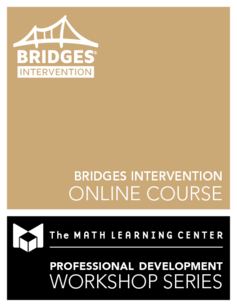 Participants will walk through the structure of Bridges Intervention, placement assessments, progress monitoring, and the resources available on the Bridges Educator Site. This course begins January 14 and ends April 7, 2019. During these 12 weeks, participants will have 2 weeks to complete each session. An additional week has been allowed for Session 4 due to the amount of time needed to complete the activities. If all course requirements are met, a letter of completion for 30 contact hours may be provided. This course does not offer college credit.